The Olney Drain complex is located at the confluence of Simcoe and Toppenish Creek near the intersection of Tecumseh and Fort Road 2 miles southwest of Harrah, Washington. The property occurs within portions of Township 11 N, Range 17, and Sections 35, and 36; Township 10 N, Range 18, Section 31; Township 10, Range 17, and Sections 1 and 2; and Township 10, Range 18, and Sections 6, 7, 8, and 18 (See Figure 1 for a visual).The property encompasses 1,257 acres of upland, floodplain and riparian habitats. Figure 1. 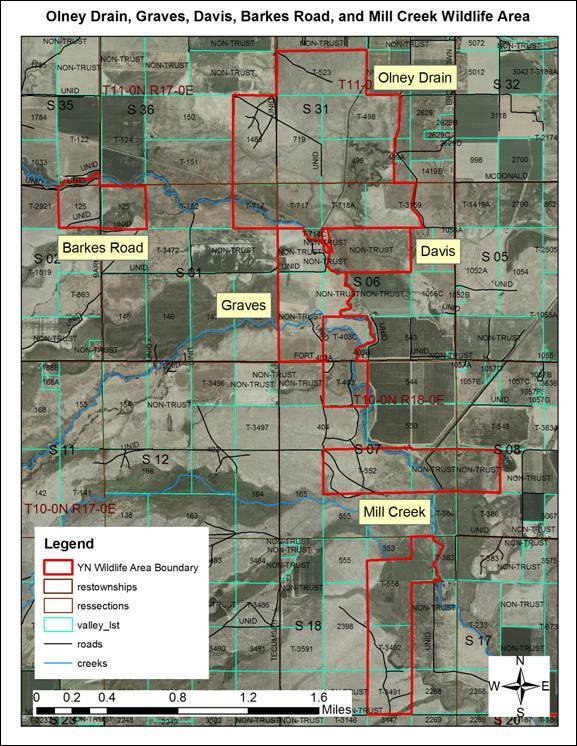 Wildlife property boundaries of the Olney Drain complex as managed by the Yakama Nation Wildlife Resource Management Program are shown in red. Satellite image shown was created in 2006. Branch Road bounds the property to the north. Yost Road bounds the property on the south. Simcoe, Toppenish, and Mill Creek are seen running through the center of the Wildlife Area complex. Olney Drain (553 acres): This property is primarily shrub-steppe and will be left unmanaged until restoration has been planned for the area. The southeast portion (east of Olney Flats Drain) of the property is currently being managed with cattle grazing due to the abundance of non-native vegetation, such as tall wheatgrass (Agropyron elongatum). Barkes Road (81 acres): The area was burned for revegetation in the late 1990’s. Both the west and east parcel were a solid perennial pepperweed (Lepidium latifolium). 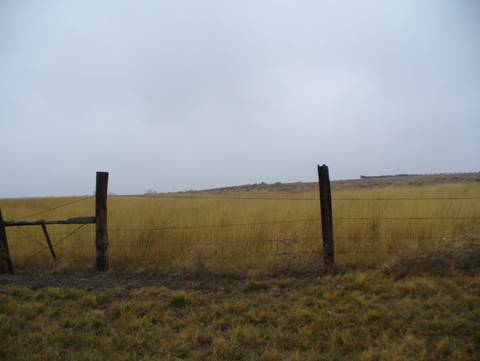 Native grasses were planted; however, assessments completed in January 2009, indicated that the east parcel was unsuccessful in establishing native grasses. Perennial pepperweed (Lepidium latifolium) returned to the northern half of the parcel of the east parcel and needs to be addressed in future restoration. A natural wetland is present in the southern section of the east parcel. 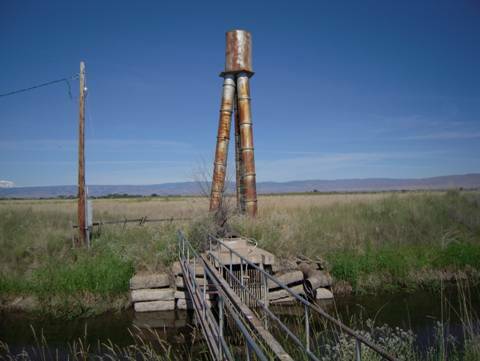 A water control structure was installed to manipulate water levels. Davis (71 acres): The property was a donation from the Farm Services Agency. Approximately 75 acres of irrigation water has been assessed. The area may be cropped due to available irrigation water until restoration is planned for this site. Graves (143 acres): This area was grazed in the past, cattle have since then been removed. During the summer of 2008, the portion north of Fort Road was revegetated with upland grasses after an accidental burn. The area south of Fort Road is experiencing issues with trespass horses. 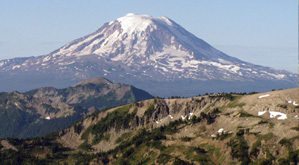 Fences will be repaired and trespass livestock will be removed. No restoration is planned at this time; however, wetland restoration from Toppenish Creek may be a possibility. Mill Creek (405 acres): Mill Creek flows across Tecumseh Road and into what used to be floodplain of Toppenish Creek. Historically, the creek flowed south of Toppenish Creek and into Mud Lake at the Toppenish Pumphouse Wildlife Area; however, the infrastructure present along the corridor restricts flow to this historic channel. Restoration efforts are directed towards lifting the creek and reconnecting flow to the historic channel and associated floodplain. Archaeological and Cultural resources inventory of the Olney Drain Wildlife Area was completed in FY 2008. The results of this survey included the location of a significant amount of historic and prehistoric resources. It is apparent that this area has undergone significant human use throughout history and into prehistory. More recently this area has witnessed heavy grazing and intensified agricultural use since at least the 1920s. The Olney Drain Wildlife Area represents a rich and unique cross section of Yakima Valley history. What are the management goals for the Olney Drain Management Area? Reestablishment of streambed and flow levels to historic level. This includes re-establishment of the side channels on the property in such a manner that natural flows are allowed to return through the property. What restoration activities are taking place on the Olney Drain Management Area? Creek grade and flow level restoration: The Toppenish Creek corridor has been greatly altered. A proposed project is to repair the main channel incision, allowing flow to enter the other channels when Toppenish Creek flow increases over the summer minimum. The water in the channels will be allowed to re-hydrate adjacent wetlands that have been dry for decades. During low-flow periods in summer and early fall, Toppenish Creek cannot sustain three flowing channels. The inlets of the north and south channels will be designed to assure that summer base flow remains in the middle channel. Noxious weed control. 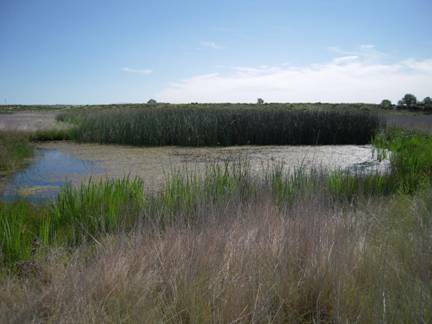 Historic cattle grazing has degraded much of the riparian and floodplain habitats present in the property by removing native vegetation and introducing non-native plant species. Many of these weed species are classified as noxious by the state and county Noxious Weed Control Boards. When uncontrolled, these species eliminate native vegetation through direct competition for water, light and space and, in some cases, through strong allelopathic effects which reduce survival or germination of native species by chemicals exuded by the weed species. Noxious weeds also readily colonize moderately or undisturbed areas. Annual control of noxious weeds throughout the Wildlife Area: Dominant weeds include Perennial pepperweed (Lepidium latifolium) and kochia (Kochia scoparia). Selected areas dominated by non-native species that reduce wildlife value, particularly tall wheatgrass (Agropyron elongatum), may be managed with cattle grazing until revegetation with dominant native species can occur (Figure 9). Figure 11 shows the location of areas dominant in non-native species, such as tall wheatgrass (Agropyron elongatum). Areas dominated in noxious weeds, for example, perennial pepperweed (Lepidium latifolium), kochia (Kochia scoparia), reed canary grass (Phalaris arundiaceae), or knapweeds (Centaurea spp. ), will be managed with cattle grazing until revegetation with dominant native species can occur (Figure 10). Figure 11 shows the location of areas dominant in noxious weeds. Installation and maintenance of boundary and internal fences that exclude cattle is the primary management tool to promote healthy riparian areas. Hydrologic restoration, described in Water Management above. Weed control of selected species. Propagules (cuttings, container plants or seed) may be reintroduced where seed or vegetative propagules are absent and natural dispersal is unlikely, or where their use may be used as a tool in weed management. Control weed species before and after revegetation to reduce competition with seedlings. One year of initial weed treatment is required prior to revegetation to control annual weeds; up to three years may be necessary to adequately control perennial weed species. Suppression during the first 1-2 years of plant establishment is critical to prevent weed species from killing reintroduced seedlings. Revegetate using seeding equipment or planting container plants. Local genetic material is preferred, and selected species that were collected from the Reservation are currently in cultivation. 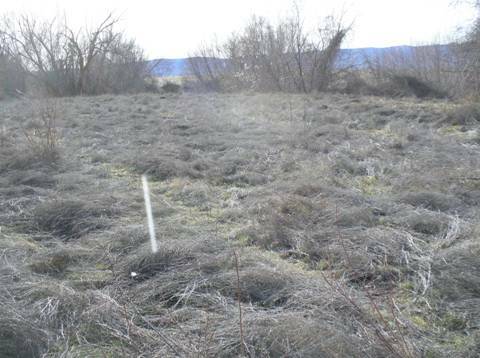 Native grasses are planted in late fall prior to winter and spring precipitation, and are not irrigated. Following grass planting, weed species are controlled with herbicide for 1-3 years until the native bunchgrasses are established. When grass stands are mature, they may be burned to stimulate growth and reduce biomass. At this time, native shrubs and forbs, such as basin big sagebrush (Artemisia tridentata spp. tridentata), rabbitbrush (Ericameria nauseosa), and greasewood (Sarcobatus vermiculatus), may be reintroduced if there is little opportunity for natural colonization. The monitoring of wildlife use on the property will assist in the determination of the necessity of specific control actions. Fish Management: Riparian habitat and hydrologic restoration actions have been designed to provide spawning, passage and rearing benefits to salmonids. Riparian vegetation was altered or removed for management of diversion, intensive grazing, and croplands. The maintenance of flow through the channel and wetland complex on the property is critical to salmonid spawning, rearing and passage. Fish management activities will also include revegetation of native riparian shrubs and trees that create shade and provide woody debris for fish habitat.